Opened on June 6, 1956. Their web site says that their screen is 120 feet wide and 52 feet high. 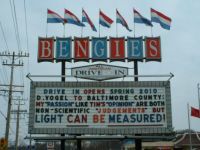 This movie theater is near Middle River, Baltimore, Chase, Essex, White Marsh, Perry Hall, Rosedale, Nottingham, Upper Falls, Raspeburg, Joppa.